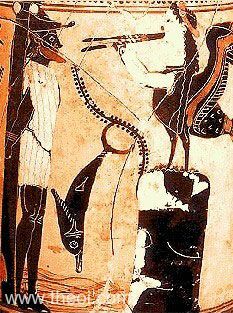 Odysseus, tied to the mast of his ship, listens to the music of a Siren. The creature has the head and arms of a woman and the body of a bird. She stands on a rock playing a double-flute. A dolphin dives between the two figures. A second Siren (not shown) stands behind the first playing a lyre.